It's not without its shortcomings, but MetaSynth's unique visual approach will continue to thrill intrepid sonic explorers. Improved audio resolution. Multiprocessor support. Significantly improved instruments. Painting with sound can be addictive! No MIDI import. Only one level of undo. Clunky interface. Takes dedication to master. For those who are familiar with MetaSynth, the name conjures up images of vast sonic playgrounds where sounds are rendered with brush and colour. The MetaSynth user does not turn knobs on a photographic reproduction of a venerable old synth, but instead 'paints' sound using brushes and tools that bridge the gap between art and audio. The improvements in v5 are too numerous to cover here, so check out the demo on the website, which includes full documentation and a complete 'what's new' list. The action takes place in any of six 'rooms', each of which is devoted to a specific type of audio design or manipulation. Each room is depicted in the lower half of the GUI, with the upper portion always showing the Sample Editor. Anything created in the rooms can be rendered to the Sample Editor, and thus made available to other rooms for further tinkering. Much of your time will likely be spent in the Image Synth Room, which is best described as a super-high resolution piano roll - each vertical pixel on the canvas represents an oscillator of a different pitch, with the brightness determining volume. The tuning map (ie, key and scale) can be selected from a menu, and you can define your own such maps. The default oscillator is a sine wave, but you can use any of MetaSynth's instruments as a source (see boxout for more). You might already know that photos can be imported into the Image Synth Room. And by painting with the various drawing tools (eg, line, circle, curve, smudge, etc) you can create original sounds, eg, a fast downward sweep could give a kick drum noise. "Much of your time will likely be spent in the Image Synth Room, which is best described as a super-high resolution piano roll." With a little effort, complete soundscapes, phrases and rhythms can be crafted, and rendered out for use in any sampler, including MetaSynth's own built-in Sampler and MultiSampler instruments. Notable Image Synth improvements are that the Fit To Scale command provides a bunch of new scales, and there are new drawing tools designed specifically for filters and percussion. The Image Filter works almost exactly like the Image Synth and shares pretty much all of its improvements. Here, the image is instead used to filter a sound (eg, paint only across the top of the canvas and you'll hear only treble sounds). The Effects Room offers 25 effects for your processing pleasure, ranging from simple volume, pan and pitch tweaks to more exciting options like Waveshaper, Reverb, Resonator, Harmonics, Inertia, Stretch, and more - certain parameters can also be modulated via a freely drawable envelope curve. Additions for v5 include a Convolution parameter for the Crossfade effect and a Render To Disk command that allows you to overcome v4's six-minute file length limit by writing straight to a file. A simple piano roll is found in the Sequencer Room - it's handy for knocking out quick tunes with sounds created elsewhere, but you can't import standard MIDI sequences, annoyingly. 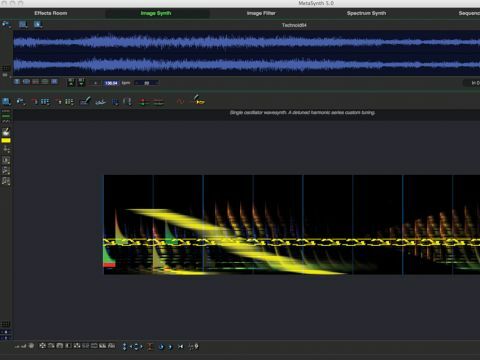 The Montage Room is a sort of multitrack MetaSynth process recorder and sequencer, where you cobble together compositions from your MetaSynth creations. Version 5 has some serious new goodies in tow, including support for up to 24 tracks and new effects in the form of PingPong Echo, Reverb, Vox Enhancer and some EQs. Multipoint envelopes are now provided, as is stereo recording. Finally, there's the Spectrum Synth, MetaSynth's FFT-based resynthesizer, which breaks sounds into chunks of harmonic content called 'spectrum events' - this differs from the Image Synth because the frequency resolution is far finer (whereas the timing is less so). Sounds can be imported, analysed, sliced and rearranged in time and pitch. New for v5 are Time Blur, which smoothes event transitions, and the frequency-smearing Pitch blur. MetaSynth's Image Synth and Sequencer rooms play back your painted pixels and sequences using the built-in instruments. There's a handful to choose from, including the simple single-oscillator WaveSynth, the granular/wavetable GrainSynth, and MultiWaves, which is a wavetable synth that uses FM, phase distortion and pulse width modulation to shape a trio of wavetable oscillators. Additionally, you get the single-layer Sampler and a Multisampler for when you need more complex sample sets. MetaSynth 5 includes 11 new MultiWaves instrument modes specifically designed for electronic music styles. New modes range from Waveshaper LFO to FM Sweep and Cascade to Pulse Width Modulated and more besides. Velocity mapping is now available, enabling velocity to be lashed to various target parameters such as modulation amount, FM feedback, modulation frequency and more. "MetaSynth 5 includes 11 new MultiWaves instrument modes specifically designed for electronic music styles." Other goodies include added tools for the Wavetable Editor - copy, paste, reverse, ramp, normalise and both low- and high-pass filtering are provided. The new effects added to the Montage Room also make an appearance here, where they can be applied to the Instrument outputs. Ultimately, MetaSynth's instruments now feel more like complete synths in their own right rather than simply convenient playback tools. As an example of MetaSynth in action, you might use the Image Synth Room to create a descending minor tonal stab, then shuttle it over to the Sequencer Room to create a riff, using the stab loaded in a Sampler instrument. Next, bounce the riff into the Effects Room and apply waveshaping and modulating echoes, then dump that into the Spectrum Synth to reorder the spectrum events and slide their frequency content to create something wild and esoteric. MetaSynth 5 remains an OS X-only affair, but is at last a Universal Binary, fully compatible with Leopard and multi-processor machines. It now supports 32-bit files and sound buffers are likewise 32-bit, with 64-bit floating point maths throughout. Conveniently, MetaSynth now loads MP3s (though it can't save them), and can read and write AIFF, SD2, CAF and WAV formats. Moreover, recording has been added to the Sample Editor and the Montage Room. A few things have been axed, though, such as support for dual mono files and MetaSynth 2.x files. And the GUI is still rather clunky and more than a little old school - there's only one level of undo, for instance. MetaSynth is a costly, complex and sometimes confusing program, but it's undeniably special. Any painter will tell you that the subtle finishing touches bring a picture to life, and while MetaSynth was already a modern masterpiece, the tasteful strokes added in this version make it all the more desirable.